Free fleece throw patterns are plentiful on the web, but one of the beauties of working with fleece is, if you have a creative idea in mind, you probably don't even need a pattern to accomplish it. Fleece is one of the easiest materials to work with because it's so stable. It doesn't require hemming because it won't ravel, and it can take quite a bit of punishment. Although most patterns you come across use a large piece of fleece and add detail by working decorative elements into the edge trim, you can piece fleece like a standard quilt, or join smaller segments the way you would felted wool, by abutting and stitching them together using a decorative stitch. If you do go for a standard seaming technique, give yourself more than a quarter of an inch seam allowance to accommodate the natural loft of the fabric. A half inch allowance will usually work well. For the best results, use a quality polar fleece, a thicker variety of fleece fabric that's a good weight for a blanket or cover up. You can find fleece in hundreds of styles and colors. Printed fleece fabrics are very popular and sport themes that will work with almost any hobby or décor you have in mind. A great deal of creative effort goes into decorating the edge of fleece throws. Although you don't have to add a finishing hem to fleece, adding something to the edge will make the project look more professional. You can take a few of approaches when addressing edges. The most conventional is to add a binding, but with the abundance of tools and techniques out there, you can finish a simple throw with many faster and frankly more entertaining methods. A new and eye-popping approach is to use a specialty cutter, usually a rotary cutter (a kind of pizza roller for fabric), with a unique blade. Common, decorative blades create scalloped or pinked edges, although newer skip-stitch cutters will evenly space holes close to the edge of the fleece creating a perfect opening for a blanket or crochet stitch. 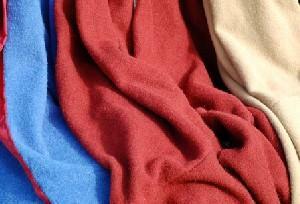 If you want something simple and dimensional, add thin strips of fleece to the edge as fringe. A simple fleece blanket would use a couple of yards of fleece, which is usually around 60 inches from selvage to selvage, with your edging technique of choice. That's it. Something a little more elaborate could follow the general pattern of a Snuggie type blanket that adds rudimentary sleeves. Now that you have some free fleece throw patterns to work with, you're bound to come up with a style that works for your application. If you're planning on using a rotary cutter in your project, though, be sure to handle it with care. There are special cut resistant gloves available for use with rotary cutters that will make it easier to use this nifty but potentially dangerous tool.